What is the Process Server Institute? The Process Server Institute (PSI) is an educational organization in California, dedicated to the study and teaching of the art and business of process serving. PSI offers a series of entrepreneurial seminars throughout California that teach the fundamentals of process serving, the laws that govern service of process and completing proof of service. The seminars include a skip tracing-investigation segment, and a discussion on marketing services to the legal community. Our Beyond the Basics seminars include the basics, and also cover service of process by special court order, publication, and by alternative means. Both seminars have value to both beginning and seasoned process servers. The seminars are taught from a process server’s perspective and cover the technical aspects of the service statutes. The practical or “how-to” portions of the seminars are presented by experienced process servers and private investigators. We now offer a notification service for PSI seminars and dinner events. Please sign up using the mail chimp form in the right column of this page. We also invite comments, questions, and participation on this blog and our Process Server Institute Facebook page. Topics will include the developing progress of E-filing, E-service, and new technology. 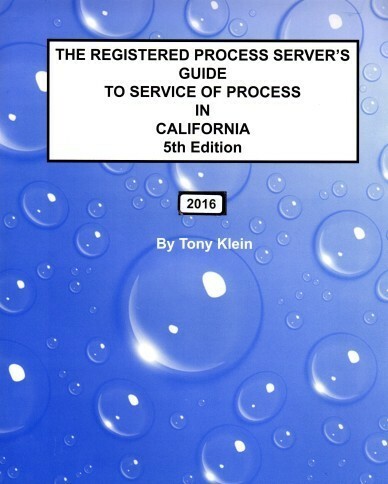 the most comprehensive guide about process serving in California. It is thoroughly researched and written from a process server’s perspective. 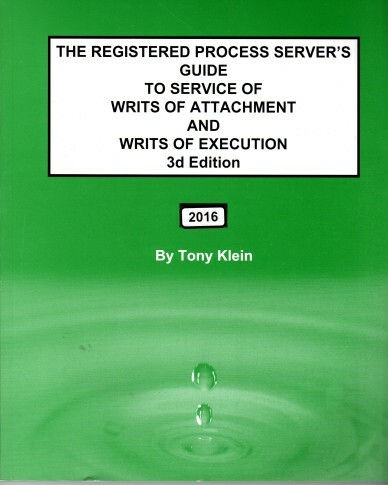 The book explains the proper procedures for service, defines legal terms, provides a service checklist for process servers before, during, and after service, and describes how to operate a successful process serving business. Although the book is written based upon California law, it covers topics that are universal to all process servers in any state. It is an ideal source for training process servers. The book is available for purchase at a 10% discount at our seminars and dinner events. a step-by-step guide for serving a pre-judgment or post judgment writ in California. Included are also exemplars of letters of instruction and service documents, and blank letters and proofs of service forms. The 3d Edition now includes exemplars for serving a real property levy. Both books are updated through this year and are included at our Annual What’s New for Process Servers dinner events in January where we discuss the new laws, appellate decisions, forms, and changes affecting process servers. The Affidavit of Proof of Service Requirements Guide, California Edition describes how to prepare the California Proof of Service of Summons-POS-010 forms and Notice to a Tenant. A section is devoted to preparing a Proof or Service or an Affidavit of Service for use in every other state. The guide is intended to supplement The Registered Process Server’s Guide to Service of Process in California, 5th Edition. We also intend to create consistency and standardization between a process server preparing the proof of service and the court clerk that needs to review it. The PSI Process Serving Seminars and Events are held throughout California and are designed for the new and novice process server, and for those with more experience who want to brush up on the changes in the law. Some of our seminars cover more advanced topics, but not too advanced that any person attending will be completely lost. The seminars are presented from an entrepreneurial perspective, are geared for someone working in the process serving or legal support industry, inside or outside the office. We assume that the person attending has a general working knowledge about the subject. We encourage participation and questions that enhance and change the seminar content. No two seminars are alike, even when they cover the same topics. Many of our attendees repeat the seminars and always learn something new. Specially designed seminars are available for in-house training sessions at law-firms or larger process serving agencies. PSI also schedules dinners that feature a special speaker or war story presentations. The dinners are a pleasant way to learn something, socialize and network, and to put a face to the name of an affiliate or competitor. See our Schedule for future events. Training an “independent contractor” process server is an important element that both the IRS and the California Employment and Development Department (EDD) use to classify a worker as an employee. An independent process server could find the training they need at a PSI Seminar. If you retain independent contractors, they could be re-classified as employees if you train them. We can also provide in-house seminars for a minimum of 5 persons. How do you file a complaint against a process server? Who governs them? If you want to sue the process server for damage that occurred, you would file a lawsuit in a court. If the process server did something that violated a process serving law, the court where the action is pending might, upon proper application, set a hearing. If you prevail at the hearing, and it is egregious enough, the matter may be turned over the the County Clerk where the process server is registered who would refer it to the local District Attorney and an administrative hearing might be initiated to revoke the process server’s registration. If you are just upset because a process server delivered bad news to you, that is not enough to file a complaint against a process server. California process servers are registered in the County Clerk’s office where they either reside or do business. They are not “governed” by the County Clerk. They are just registered at that office.